After spending a relaxing Christmas day together, we decided that the day after Christmas would be a good day to do some long-needed cleaning. Specifically, we needed to clean out the storage closet in our apartment, which is 1’10” wide by 2’8″ deep by 7′ tall and was packed completely full. So, that’s what we did. Well, first we went to see a movie. The new live action Peter Pan. It was a decent movie. I give it 7/10 and Jeni gives it 6/10. When we got back from the movie, we dug right into the closet. After we ate dinner. Leftover lasagna and Martinelli’s Sparkling Apple-Cranberry. Mmm. Four hours later, when we finally emerged victorious over the storage closet, we had accumulated three bags full of trash and two bags full of stuff to give to the GoodWill. These were 33 gallon trash-bags. We were left with only 3 mid-sized boxes and one bag of stuff left to put back in the closet. Following are the tales of Tim’s life that are told by some of the items that were excavated from this closet. My first car. It was the product of hundreds of hours hard work and months of saving. A symbol of freedom and independence. And on November 9th of 1997, on the 8th anniversary of the fall of the Berlin Wall, it was a twisted hunk of useless metal. You may instinctively place the blame for this wanton destruction on the teenager with the driver’s license, but if you did you would be amiss. In fact, as I drove defensively at 35mph along a winding two-lane country road to do some studying with my friend Lisa B., a man driving a light pickup truck blindly turned left just in front of me. With very little time to react, I slammed on the brakes and on the horn. 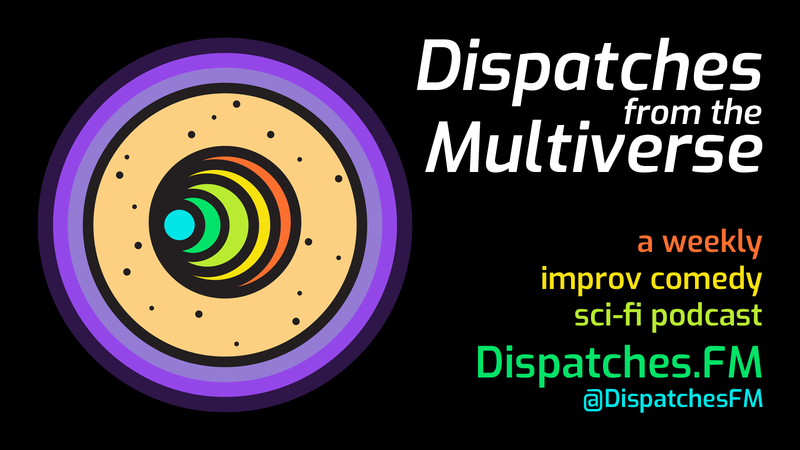 As the truck grew larger and larger outside my windshield, I began to have a sense of detachment from my surroundings. Indeed, as my car came crashing into the side of the small truck, planting itself into the other vehicle with the screeching of twisting metal, I began to feel as if I were dreaming. The engine still running, I surveyed the detail work in the side of the pickup as I collected my nerve. While I spoke with the absent-minded driver of the truck, a man I had never seen before walked up seemingly from nowhere and said “Tim?” This did not help me convince myself that I was not dreaming. As it turned out, the kind man who knew my name was the father of one of my classmates, as well as the principal of the elementary school where my youngest brother attended and my mother volunteered. When we contacted the police, they refused to come to the scene since we had already moved our cars and nobody was hurt. Fortunately there was a witness, plus by the way the cars were damaged it was obvious that the collision was not my fault. 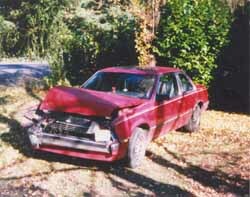 But the really important detail to remember about this story is that my puny little 1983 Chevy Cavalier was able to drive home, and the burly little pickup had to be towed from the scene. My car triumphed in it’s only skirmish. However, the damage was extensive enough to cause the insurance company to “total” the car. One of the oldest items that we drew from the storage closet was this photograph of my car in my parent’s front yard just after that wreck. 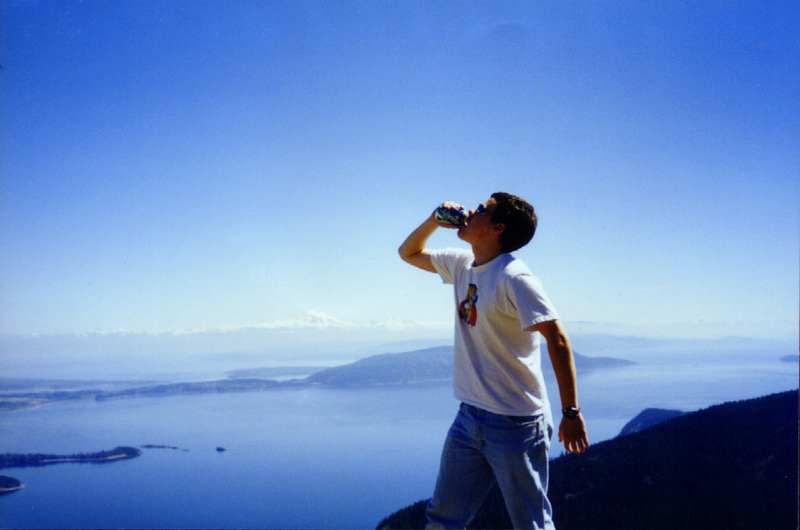 Late in my freshman year at SPU, my dorm floor, 5th Hill, went on an all-floor retreat to Orcas Island. The weather was beautiful, and we all had a great time. We trekked to a mountaintop, and jumped off of towering cliffs into a pristine lake. 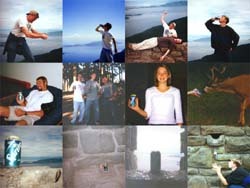 The photo on the left was recovered from the storage closet, and shows me perched upon the peak of Mount Constitution on Orcas Island. This photograph proves that Sprite will make you beautiful. Well, maybe not. But the following Labor Day weekend, myself, J.R., and Nathan Devena set out upon a quest in the great Northwest to prove that Sprite can at least be a heck of a lot of fun. As we trekked about the San Juan Islands, Bellingham, Vancouver B.C., and Seattle, we had far more fun than should be legal with a twelve pack of Sprite. J.R. squeezing a can of Sprite in the same place on Mt. Constitution. The picture above on the left. J.R. sacrificing Tim on the wall on Mt. Constitution with a can of Sprite. Nathan on the same wall, drinking Sprite. Destiny Williams grinning ear-to-ear while holding a Sprite. Tim, Nathan, and J.R. all holding Sprite. Dana Cantrell smiling with a Sprite. A wild male deer kissing a Sprite can (really). A majestic can of sprite overlooking the ocean. Nathan’s hand reaching under a stone wall to get a Sprite. Sprite in the window of a castle. Sprite falling from a drain hole in a castle wall. Hey you! I was here, and you weren’t! What Luck huh?!? Well, maybe we’ll have a next time (smiley) I haven’t seen you on line in a while, so email me k? I can not believe I’m here, in your house… oh well!!! I figured since we were in the state, we should drop by. I tried to see if you were on line last night. (you weren’t) So I talked to Nathan. He said you weren’t leaving till 4. He was wrong!! (smiley) Well I hope you have (had) fun at your friend’s wedding. I’ll talk to you soon!! ~ I haven’t actually written in a while! The last quarter of my freshman year at SPU, just as all of us bright-eyed new students were finally getting into the swing of things, the school tore down the dining hall to make way for a glorious new one. It was the first big step in their ambitious and highly touted “Comprehensive Plan for the 21st Century.” However, I for one was not impressed when the new Gwinn Commons opened in the Fall of 1999. It looked all shiny and new, yes, but for a brand-new dining hall in a school that plans to expand, it was already sorely short on space. At dinner and lunch rush times, you sometimes had to wait for 10 minutes after filling your dinner tray to find a seat. It was, in a word, ridiculous. Plus, to top it all off, they got rid of the self-serve sandwich bar, and no longer had ICE CREAM! For further reading on my thoughts about this matter, please refer to this opinion column on the DUI website. It wasn’t that the new Gwinn was a smaller building than the last one. In fact, it was much larger. They had even added a second story. The main problem was that all the extra space that they added was allocated very poorly. When we heard that they were putting on a second story, we imagined a design where we would get our food downstairs, then go upstairs to eat. Alas, as it turned out, the second floor was built not for general student use, but rather to be a special meeting hall, to be used for special occasions only. 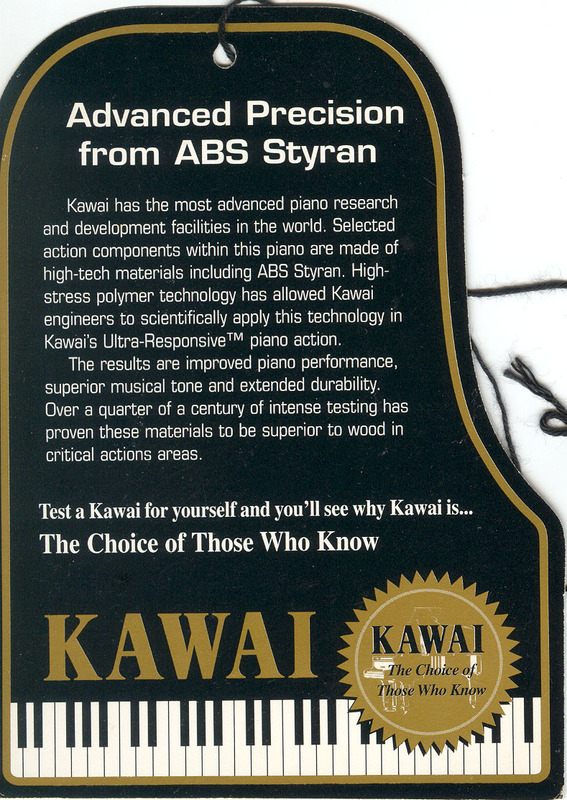 One of the finishing touches on this disappointingly useless upstairs was a brand-new black baby grand piano. Before the official opening of the upstairs portion of the building, J.R. and I were able to take an unauthorized trip upstairs and check it out. When we entered the foyer, there sat the piano, without a fingerprint on it, and still with the tag hanging off. So, I did what anyone would do. 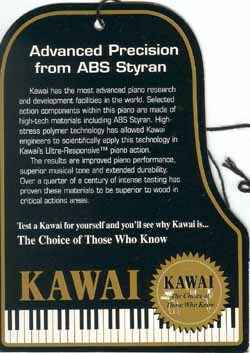 I sat down, lifted the key cover, took off the protective shipping felt, and plunked out a few tunes. And I kept this tag as a souvenir. Picture this: A dorm floor with 45 guys, mostly Freshmen and Sophomores. 45 guys who like to play video games, a lot. Now picture these 45 guys realizing that perhaps they like video games a bit too much, and swearing off video games for one week. What you have just pictured is 5th Hill in March of 2000, my Sophomore year. As a result of this video game fast, some of the guys started to get creative when thinking about how to spend all that extra time. Studying? Hah, no… What we dreamed up was the glorious game that is: Mafia! We split the floor into three “families,” each with about 10 guys. Then we all went out and bought cheap NERF dart guns, set out some basic rules for how to “kill” someone, and went at it until there was only one family standing. Kills were not allowed anywhere in the dorm building or in the dining hall, but pretty much anywhere else was fair game. But that wasn’t all either. One of my family members used to have the same locker, so he knew the combination. So, one of my remaining family members and I went down to the music building. I hid inside the locker while he waited in a practice room nearby, ready to spring out at a moments notice. After about half an hour, the tiny slits that I could see out of finally darkened. My prey had arrived! My muscles tensed while he turned the dial and opened the latch. As he cracked the door to the locker, POP! Out stuck my weapon, and planted a little green dart right between the eyes. He never saw it coming. You can read more about 5th Hill Mafia here. 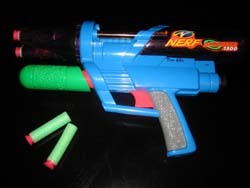 My trusty four-shot NERF Supermaxx 1500 was another treasure that was unearthed from the closet. For the duration of my Freshman and Sophomore years at SPU, I lived in the dorms. In fact, I had little choice in the matter, as it was SPU’s policy to require undergraduates younger than 21 to live on campus. As it turns out though, I actually really enjoyed my time in the dorms. About halfway through our Sophomore year, J.R. and I had decided that we wanted to stay on 5th Hill for at least one more year. The way we figured, living on a floor with 40 other guys, staying up late, playing pranks on neighbors… all of these things are something that you really only get to experience once in life. You’ve got a four-year window of undergraduate college life, and that’s it. So, as long as we’re enjoying it, why not take advantage of that window? 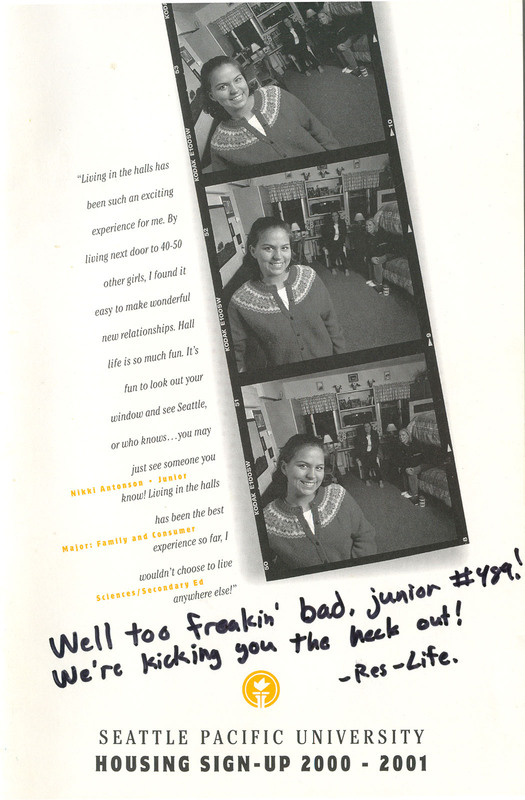 Well the answer to that question, as it turned out, was “Because Res-life says: ‘You can’t. Get the heck out of our dorms. '” As spring rolled around, and housing signups loomed mere weeks away, university officials let out a little secret that they had been holding all year. They were out of space. More people wanted to live in the dorms than they expected, plus more of the applicants that they admitted were accepting. 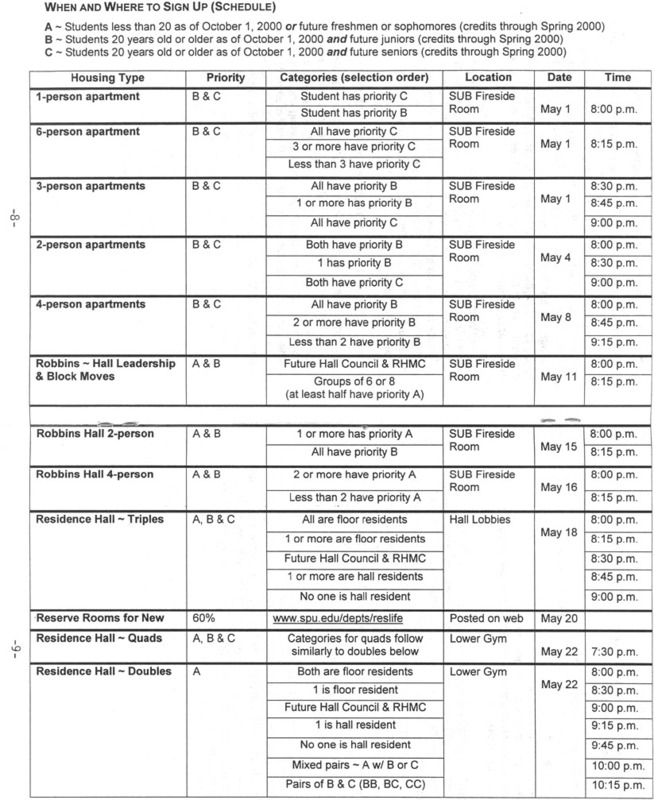 New rules were put in place as to where students can and can’t live on campus. One of these new rules just so happened to be that Juniors were virtually banned from the dorms. If they were involved in some sort of leadership (hall council, PA, SMC, etc.) they could be in the dorms, and technically, a “normal” Junior might possibly be able to get into the dorms, but we were dead last in priority, and because of the order of signups, if we tried to sign up for the dorms and didn’t get in, we would be out in the cold and unable to live on campus at all. Living in the halls has been such an exciting experience for me. By living next door to 40-50 other girls, I found it easy to make wonderful new relationships. Hall life is so much fun. It’s fun to look out your window and see Seattle, or who knows…you may just see someone you know! Living in the halls has been the best experience so far, I wouldn’t choose to live anywhere else! November 2000. Is there anyone who here who can tell me what major event happened in the USA in November 2000? Yes, you in the back, with the striped shirt. That’s correct. The presidential election is what happened in the year 2000, in the month of November. In fact, it lasted the whole, stinking month. The never-ending election. I do not want to know. I do not wish to waste my time. Instead I’ll get some sleep sublime. -or play a couple games of hearts. Anything but those nervous charts. Rest now. Rest my tired eyes. And dream of sweet blue cloudless skies. Now in the morning I awake. -and eat it too, oh yes indeed. But wait, oh no! What’s this I read? It seems that it is still not done. Alas, the race is far from won. Days went by, then weeks, then months. Finally one man got his wants. That’s right. I’m not ashamed to post silly personal writings on the Internet for anyone in the world to read. I have no shame. But then, if you’ve read much of the rest of this site, you knew that already. There are many things that college guys do when they are short on sleep but not short on creativity. In one such instance, J.R. and I were having a conversation with the illustrious Matt Basinger, we touched on the topic of winning. You may have heard the cliché “Winning isn’t the most important thing in life” or “Winning isn’t everything” before. As we discussed winning, we came to agree. Winning definitely isn’t the most important thing in life. It’s third. Right after eating and sleeping. But why stop there? We created an entire foot-in-mouth err, I mean tongue-in-cheek list of the top most important things in life. And now I present it to the world, in all it’s majesty. Y2K. I bet you got tired of hearing those two letters and that number. I know I sure did. Two-digit computer years—oh no! The world is going to collapse upon itself! Stock up on duct tape, water, and snow shovels! Hunker down in your fallout shelter! What a bunch of hooey. And yes, I stated that it was a bunch of hooey before all the hype fizzled into nothingness on January 1st and nothing happened. Well it took until over a year later, but I finally found a real-life occurrence of the Y2K bug! Really! On Laura Scherschel’s birthday, a bunch of us came out to Spokane to chill with her. That night, we went out for a fun game of laser tag. 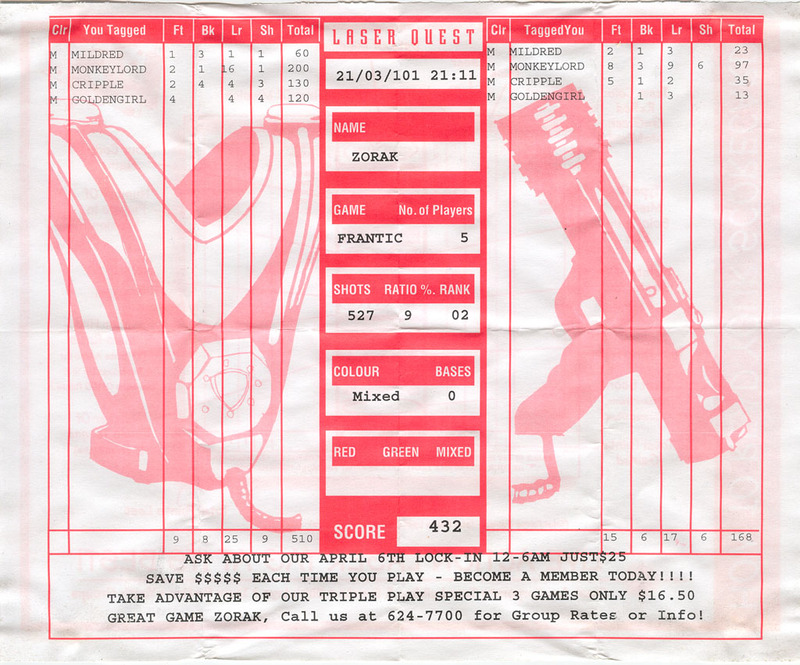 Check out the Laser Quest score sheet from our game at the left. That’s right. 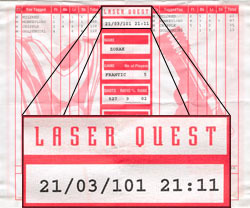 According to the zoomed portion, our laser tag game took place on March 21st, 20101 at 9:11 PM. Whoops. I guess Laser Quest should have stocked up more duct tape. I didn’t write this poem. But I like it. A portion of it is quoted in the movie Groundhog Day, by Andie MacDowell. I found a printout of it in the closet, and felt like sharing it here. Enjoy. Last but certainly not least, I will share with you this gem of a picture. Taken by one Miss Laura Scherschel at her lovely apartment in the fall of 2001, contained within you will see J.R., his sister Erin, and myself. The small pumpkins that we are holding were a part of the party activities for the evening. Erin carved a happy pumpkin. I carved an angry sneaking pumpkin. 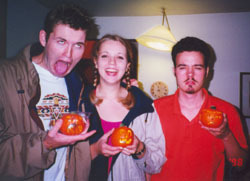 J.R. continued his illustrious pumpkin-carving tradition and carved another in a long line of barfing pumpkins. Unfortunately however, there were only enough mini-pumpkins for each of us to carve one, and so J.R.’s barfing pumpkin was unable to be portrayed as also being consumed by another pumpkin. 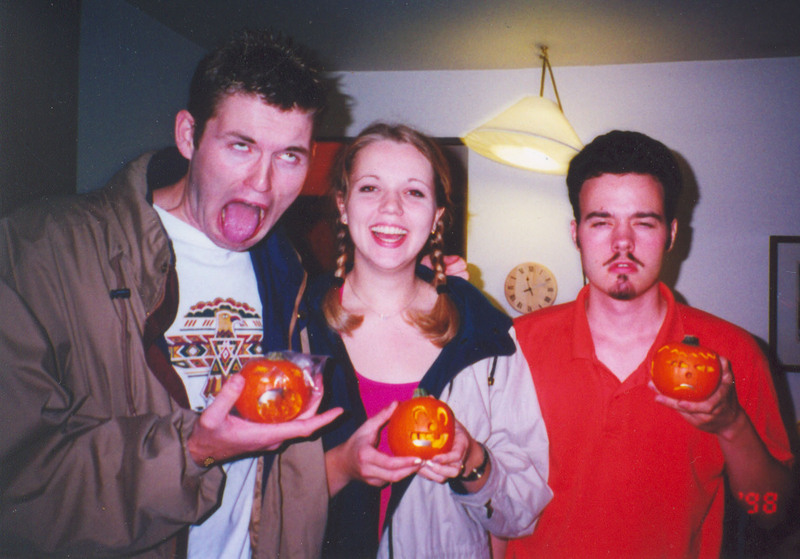 In the picture, each of us is attempting as best we can to make the same face as our pumpkins. I have always really liked this picture. To really appreciate the affect, you’ll need to click on the picture to view a larger version. It really is grand.